Do you want to sell more and make more money? Do you want people who buy from you say that you have a fantastic attitude? YOU CAN Program yourself to super-boost your positive mind-set and feel AND BE great! “I am on the dawn of achieving wonderful new goals. I am the BEST sales person that I can be. I exceed all expectations. I see myself achieving massive results, awards, bonuses. I’m the best salesman that I can possibly be. I can smell the money. I can feel the respect. I know where I’m going, I know what I want, and no-one gets in my way. I manage my time well. I plan my day and I work my plan. I maximise timing results around my body-clock. I know when I am at my best. And I use that time for maximum productivity. Dr Janet Hall then gives you a strategy to break through limiting thoughts and past upsets which empowers you for the best future in sales possible. Be Persistent – keep listening and you will get fantastic sales results! 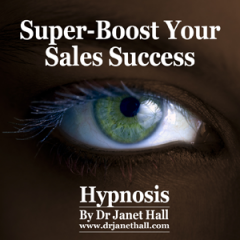 So, if you’re serious about wanting to be a fabulous salesperson then you need to get a copy of “Super-boost Your Sales With Hypnosis” right now!